27 year old Mukesh Kumar hails from Kanpur, Uttar Pradesh. He is the youngest of the four siblings who are all visually impaired. Mukesh suffers from Retinitis Pigmentosa since birth. His parents were keen that their children should all get a good education as best as they could despite blindness. 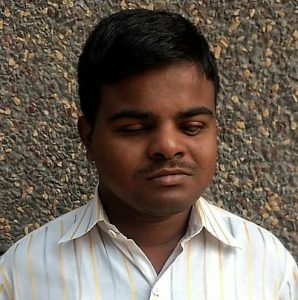 Like his elder brothers, Mukesh studied in Delhi, staying at the hostel provided by National Association for Blind (NAB). After completing his Class 12th, Mukesh was keen to pursue further education and he completed his Bachelors and Masters in Hindi from Delhi University. Up until this point, he was following the usual course of education hoping it would lead him to a government job like his father. But as a blind person, Mukesh didn’t know what steps to take next. He didn’t know how he could equip himself to function among sighted people in the mainstream. So Mukesh decided to contact the Eyeway Helpdesk counselor stationed at NAB Delhi. The counselor realized that even though Mukesh was a Post-Graduate, he lacked certain skills to function independently. He also lacked focus in terms of a career path because he wasn’t aware how much or what role a blind person could perform in a government job. So the counselor suggested Mukesh to start off with basic computer training. This would help him read and write independently and also increase his chances of employment as most jobs today require working computer knowledge. Assistive technology has to a large extent bridged the gap between how sighted and visually impaired people function. Eyeway counselor apprised Mukesh of various smartphone applications that could prove useful for him in daily living as well as employment. Since he’d studied Hindi, the counselor suggested him to apply for an Official Language Officer post in a government bank. Alternatively he could also apply for a Probationary Officer’s job. Computers and assistive technology know-how would help him prepare for the competitive banking exams. The counselor also gave him the option to apply for a Hindi translator’s job in private sector. Mukesh is close to finishing his computer training at NAB and with the help of Eyeway, he has been certified under the National Digital Literacy Mission. He is in regular touch with the counselor at NAB-Eyeway Helpdesk for updates on software and applications for visually impaired, government schemes and provisions and new job openings.